Below you can find access to the TalentFOUND toolkit guidelines as well as download design and branding elements. Please refer to the Toolkit PDF for information regarding usage of TalentFOUND branding materials. Available as high-resolution graphics and vectors in both CMYK and RGB file formats. Includes full colors, white and black versions. These .mov files are for use in video production associated with TalentFOUND. The intended length of the logo is a minimum of five seconds. The version labeled [BACKGROUND] has a white background behind the logo. The version labeled [NO BACKGROUND] has a transparent background. This graphic illustrates the key players in the Colorado talent development network, and TalentFOUND’s role as an umbrella over the network. This flier is designed for entities that are part of the Colorado talent development network, offering a more in-depth explanation of what TalentFOUND is, why it exists, the benefits it provides, and why businesses and public partners should use TalentFOUND. This flier is designed for students, job seekers and employers to understand what the TalentFOUND gateway is and give them a taste of how it can help them. This PowerPoint presentation, including talking points, will help you tell the story about TalentFOUND to co-workers and other members of the talent development network. This graphic is specifically designed to fit as the header image for use in Google Forms. Similar to the email footer graphic, this website footer graphic can be used as the unified brand entry point while also recognizing all partners involved in an initiative, event, or project. Available as high resolution PNG graphics and vectors. Includes full colors and white versions. 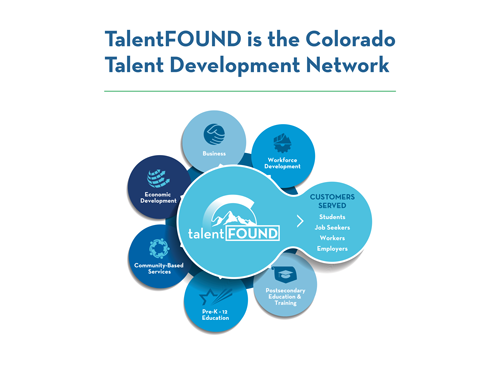 The affiliate version of the TalentFOUND logo is for use by affiliates on their printed and electronic materials to signal their connection to the Colorado talent development network and their status as an early adopter. This pencil version of the TalentFOUND affiliate logo is for use ins small or horizontal spaces where the full logo will not fit well, such as the side of a pencil. This pencil graphic can be used at the top or a bottom of a website to signal an affiliate’s connection to the Colorado talent development network and their status as an early adopter of TalentFOUND. Instead of the pencil graphic, Affiliates can use this seal on their website to show their connection to the Colorado talent development network. This email footer can be used to signal an affiliate’s connection to the Colorado talent development network and their status as an early adopter of TalentFOUND. Available as AI, EPS, and PDF files, the affiliate video footer can be used in informational videos and initiatives to signal an affiliate’s status as an early adopter of TalentFOUND and association with the Colorado talent development network. Use this content to create social media posts and promote TalentFOUND on your company pages. Available as high resolution PNG graphics and vectors. Includes full colors and white versions. The partnership of version of the TalentFOUND logo can be used for materials, websites, events that are a partnership of multiple groups from the Colorado talent development network as a single entry point and to highlight that the endeavor is a partnership. This pencil graphic can be used at the top or a bottom of a website to signal the site’s connection to the Colorado talent development network and highlight that the site has been created by a number of different partners from the network. This email footer graphic can be used as the unified brand entry point while also recognizing all partners involved in an initiative, event, or project. Available as AI, EPS, and PDF files these video footer files can be used to portray a unified brand entry point on informational videos, pre-roll advertisements, PSA announcements, etc. to recognize all partners involved in an initiative, event, or project. Use these to create “Partnership of TalentFOUND” slides for your presentations, including displaying your partners’ logos as part of your project. Available as high resolution PNG graphics and vectors. Includes full colors and white versions. This pencil graphic can be used at the top or a bottom of a website to signal the site’s connection to the Colorado talent development network and highlight that it is powered by TalentFOUND. Use these to create “Powered by TalentFOUND” slides for your presentations, including displaying your partners’ logos as part of your project.